Adam Peaty will become the first British man to win Olympic swimming gold for 28 years, says six-time world champion Mark Foster. The five-time Olympian also predicts Team GB will collect at least five medals at Rio 2016 after a successful World Championships in Russia. "Peaty will win the 100m breaststroke. I'll be surprised if he's beaten," said Foster. GB had nine podiums at the Worlds to finish fourth in the medals table. After a disappointing home Olympics in 2012 yielded just three medals and no golds, British swimming saw its flagbearer Rebecca Adlington retire and a major review of what went wrong. From just one medal at the World Championships in Barcelona two years ago to nine in 2015, the mood is different now. "There was usually someone who was guaranteed to get medals which took pressure off the rest of the team. When we went to Barcelona in 2013, it was so disappointing. We didn't really have any leaders," said Foster. "In 2012, Peaty and people like James Guy and Siobhan-Marie O'Connor were only 16 or 17. You need a couple of years for those people to grow in strength and confidence." "Becky helped an awful lot. People thought if Becky, the girl next door, can achieve what she has then why can't I do that?" he said. "The biggest shift I had when I was younger was being around Adrian Moorhouse and other top swimmers. "Any athlete or swimmer when they first start out might have the belief you want to be the best, but when you hang around the best, you realise they are just like you and it's all about applying yourself. "They get a coffee, they eat, just like you." Belief is the byword of the current British set-up, revamped after the 2012 review with Adlington's former head coach Bill Furniss and performance director Chris Spice instilling a "tough love" discipline. Foster said the current squad is not prepared to rest on their laurels, unlike some in previous generations. "I remember when I was one of the older ones and looking at some of the younger ones coming through who thought that by being on the British team they were Olympic champions," he said. "They just had this swagger as if to say 'I've made it.' Well, no you haven't. Now they seem to have a different mindset, a different belief, and hunger. "They see every training session and race as an opportunity. You need to think about how you gain that extra hundredth of a second. That's what's changed an awful lot." "I think the real positive for us is that we can do it, so it's a belief thing and a culture thing and I've got guys finishing fourth at a World Championships who are absolutely devastated and that's music to my ears. We're about trying to get to the podium." 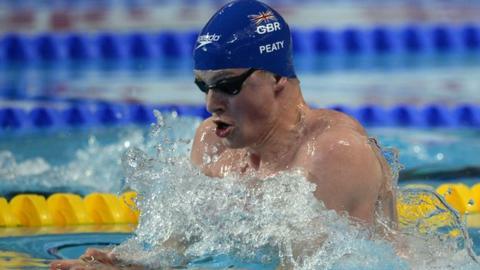 Peaty, who led the way with 50m and 100m breaststroke world titles plus a relay gold, is a prime example of that belief. Without being arrogant, the 20-year-old from Staffordshire believes he will be Olympic champion. "If you turn up with the right frame of mind, then that reflects in your results," said Foster, who specialised in the 50m butterfly and freestyle events. "If he maintains what he's doing in the 100m, they won't beat him, no chance." Peaty's mindset and world record time should help give him a start on opponents. "There is a slight mental edge when you think he has been half a second faster than anyone else in the world," said Foster. "I was always looking to the other end and thinking all I've got to do is get there first. I can't affect matey in lane one. The only person you can slow down is yourself." Coach Mel Marshall should help keep him grounded, and keep Peaty away from thinking 'Olympics, Olympics, Olympics' all the time, according to Foster. "In your head it is a big jump because the Olympics is what everyone aspires to win," said Foster. "But the two biggest threats I think - Cameron van der Bergh and Kevin Cordes - he has smashed before. "The key is not to get too carried away. Mel will manage that, give him enough space and also rein him in. "Peaty doesn't shy away from competition. He will get up and race. He's got everything, he's got the body for it, but the body and talent aren't enough. You've got to have the mindset." One man missing in Russia was American Michael Phelps - the most decorated Olympian of all-time with 22 medals, including 18 golds. After a six-month ban following a drink-driving conviction, he returned in April and set three new world bests at the US national championships at the weekend. "He's the man again," said Foster. "He probably kept his hand in and when you've done that many lengths and that many miles, you don't lose it overnight. "I think he probably had lost the hunger and then maybe thought 'What do I do next?' He's set the bar so high in swimming, how can you compare to that? "He came out of the swimming bubble, dabbled in a few things, and wanted to come back. You miss the routine, the training element, standing on the block. "Chad le Clos beating him at the Olympics would have hurt. He probably needed a new motivation. Now he has something to prove." "America will be much stronger again next year. Chuck in Michael Phelps, and he will make a huge difference," said Foster. "With Adam Peaty and James Guy, and others, I think realistically without getting too over-excited, I could see five or six medals for Britain, with one or two golds. And there could be more from the likes of Jazz Carlin, Fran Halsall and Hannah Miley. "I'm not saying we have a hundred Michael Phelps out there - he is a one-off, a huge star, phenomenal, but we have some talented swimmers. "It's the best British team I've ever seen, without a shadow of a doubt."